Most people consider white teeth to be an important aspect of an attractive smile. There are several factors, however, that lead to discoloration and prevent you from maintaining that sparkle. People with stained teeth tend to brush more vigorously, removing enamel and causing further discoloration. Over the counter whitening kits help only to a certain extent as they don't have the prescription strength or the lasting effects of a professional whitening system. 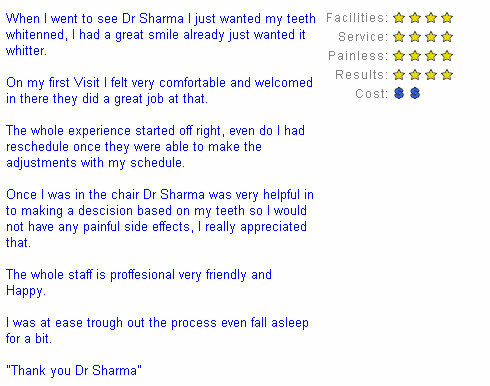 Dr. Sharma uses some of the most advanced whitening technologies. You have several options for restoring that long-lasting, bright white smile you deserve. 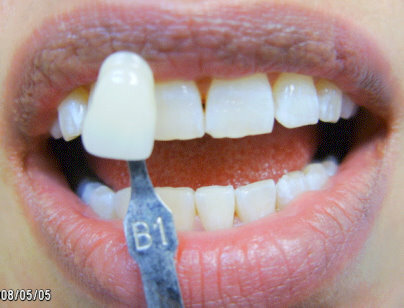 With this professional strength chairside whitening procedure your teeth will be several shades whiter in just 1 hour. During the procedure you may comfortably watch your favorite movies on a flat-screen TV. Dr. Sharma can also prepare a kit that you can take home and use at your convenience. 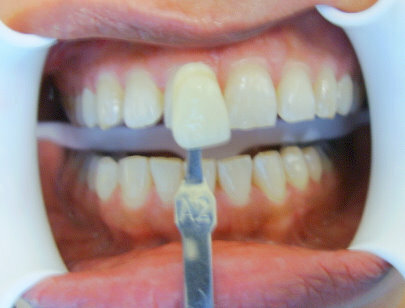 These custom fit trays contain whitening gel, and you can continue using them till you get the desired result.